Jane Goodall is an activist, primatologist and anthropologist who is considered to be the world’s foremost expert on chimpanzees. Goodall was born in London, and at a young age was given a toy chimpanzee which inspired her lifelong love of animals. She travelled to a friends farm in Kenya in 1957, where she met notable Kenyan archaeologist and palaeontologist Louis Leakey. He proposed that she work for him as an assistant, and she travelled with him and his wife, archaeologist Mary Leakey, to Olduvai Gorge in Tanzania on a fossil-hunting expedition. Leakey felt that she would be a great candidate for a chimpanzee researcher position, and in 1958, Goodall returned to London to study primate behaviour with Osman Hill and primate anatomy with John Napier. Two years later, she travelled to Gombe Stream National Park in Tanzania where she became one of the first ‘Trimates’, studying the Kasakela chimpanzee community. Goodall was able to observe behaviours that those who had been taught rigid scientific disciplines may have dismissed. She noted that each had distinct personalities, and would name them instead of numbering them. Goodall stated that “it isn’t only human beings who have personality, who are capable of rational thought [and] emotions like joy and sorrow.“ Her research would challenge two long-standing beliefs; that only humans could construct and use tools, and that chimpanzees were vegetarians. Due to the quality of her research, Goodall was accepted as a PhD candidate at Cambridge University in 1962, becoming one of very few people to be admitted without a university degree. A year later, she published her first article in National Geographic entitled “My Life Among Wild Chimpanzees.” She received her PhD in 1965, that same year the Gombe Stream Research Centre was born. 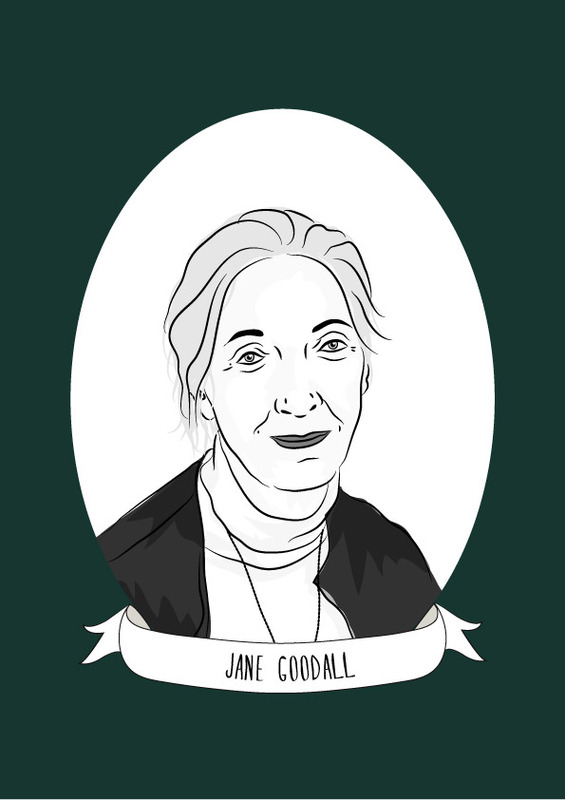 In 1977, Goodall established the Jane Goodall Institute for Wildlife Research, Education and Conservation. The non-profit fights for the protection of chimpanzees and strong environmental practices. As part of the institute, Goodall established Roots & Shoots, a global environmental and humanitarian education programme for young people. In addition to her work with chimpanzees, Goodall is the former president of Advocates for Animals which campaigns against the use of animals in medical research, zoos, farming and sport, she is also a patron of of population concern charity Population Matters and is vocal in the campaign for animal rights. She is the recipient of many awards for her work and has been named a United Nations Messenger of Peace.